On Thursday May 3 VECTOR members and Vancouver Fire & Rescue Services Fire Prevention Officers will join other teams in Metro Vancouver and the mid-Island region in activating emergency communications for Exercise SWEEPER 2018. In the early morning hours on Thursday May 3 a supercooled Arctic front plows headlong into a moisture-laden Pacific Ocean airstream directly over coastal areas in Southwestern British Columbia. 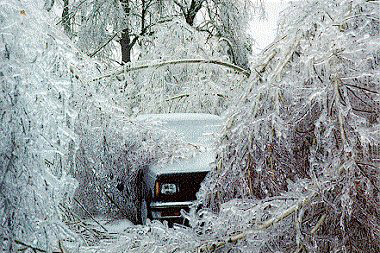 What would be just another rainy spring morning has instead become an unprecedented ice storm - in May - with movie-sized impacts the likes of which have never been seen here in Vancouver. Where is The Rock when you need him? As dawn breaks area crews are fighting a losing battle with road surfaces and the rapidly accumulating weight of ice is causing havoc with trees and power-lines coming down throughout the region. Restoring access along major thoroughfares is an urgent priority. As the city starts to wake up to an ice encrusted Vancouver, communications and power outages impact neighborhoods across Vancouver. Emergency management has activated a zone-based disaster response plan involving a number of City departments and VECTOR, the emergency communications team for the City of Vancouver. Already on alert due to the power and communications outages, VECTOR members receive word over radio links they are to deploy to designated stations located throughout the city to provide a communications bridge between partially compromised systems. It will be several hours before the departing front brings warmer temperatures and relief to the situation. While activated, VECTOR operators will pass message traffic between zone-based resources and the Emergency Operations Centre to aid City responders as needed. Exercise play helps identify shortcomings in preparation and plans, and often brings new opportunities to the surface. What is learned through this experience will feed into refinements for future exercises or emergency activations. VECTOR is the Amateur Radio program for the City of Vancouver. If you are interested in public service we invite you to join us or learn from us as we continue to build capability and capacity around which the broader amateur radio community can organize in times of need.